What is Good: Easy recipe for Oreo Truffles! Easy recipe for Oreo Truffles! During playgroup last week we made some incredibly delicious Oreo Truffles for Valentine's Day. I thought they were so good that I wanted to share the recipe with you so that you could try them for yourselves. Don't wait 'till next Valentine's day, they are super super easy, you can prepare them in just a short time. The kiddos even helped us and and they had so much fun. MIX 3 cups of the cookie crumbs and the cream cheese until well blended. Shape into 40 (1-inch) balls. To crush the cookies trow them in a 1 gallon ziploc bag and pound away until you have crumbs. 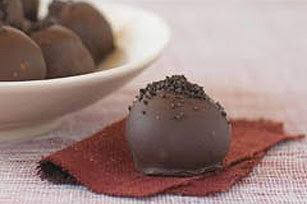 DIP To easily coat truffles with the melted chocolate, add truffles, in batches, to bowl of melted chocolate. Then use two forks to roll truffles in chocolate until evenly coated. Remove the truffles with forks and allow excess chocolate to drip back into bowl before placing truffles on waxed paper-covered baking sheet.